The Abydos King List, also called the Abydos Table or Canon is a list with the names of 76 pharaohs of Ancient Egypt. 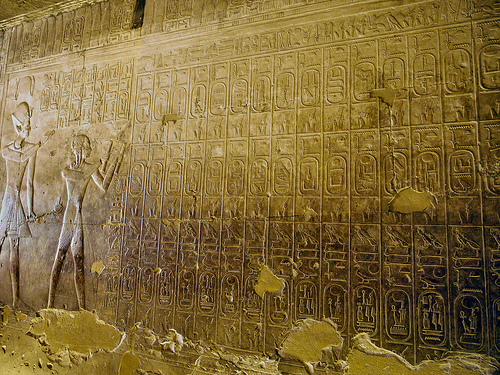 It is still on a wall of the Mortuary Temple of Seti I at Abydos, Egypt. It consists of three rows of thirty-eight cartouches on each row. The upper two rows contain names of the ancestral kings, while the third row merely repeats Seti I’s throne- and birth-name.